As can easily be seen from the plot above, these devices assess the high frequency range, but do not assess the low frequency range. They are not equivalent devices to rotatory chairs because the low-frequencies are missing. The method of identifying "abnormalities" on one variant -- the "VAT" test, noting individual points that are outside of 2-SD limits, breaks a well known statistical principle called the "Bonferonni". Without a-priori knowledge of expectations, the significance (p-value) of multiple t-tests needs to be divided by the number of measurements. In other words, just because one point is outside of the 2SD range does not mean that the person is abnormal. The range needs to be multiplied by the number of observations (making the test useless), or a more sophisticated statistic developed for normality. The two different commercial devices vary systemically in phase (Hirvonen et al, 1999). Muelenbroeks et al (1995) observed that a systemic problem with these devices is the method of sensing head rotation, as there can be slippage on the head, causing high-frequency phase to be distorted. Tirelli et al (2004), suggested that the test-retest reliability of the Vorteq device was insufficient. Unfortunately, these devices have been associated with billing fraud. Our position on these devices is that they are simply not rotatory chairs, and should not be billed as if they are the "real thing". It would be reasonable though to have a billing code designed specifically for this variant, as the test does have value. If you have a rotatory chair test, there is generally no need or strong indication to get a "VAT" or "VORTEQ" test as the information supplied is largely redundant. It is possible to have a moderate loss of vestibular function on a rotatory chair test, but have the VAT/VORTEQ test miss the diagnosis entirely. This is particularly possible in a person who has had a few years to compensate for a bilateral vestibular loss. 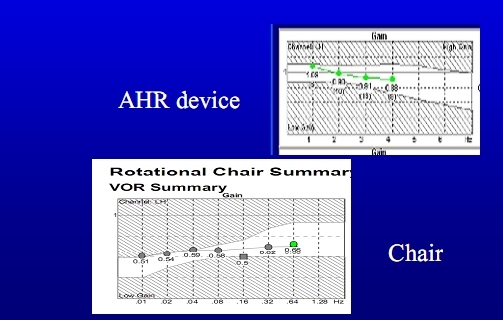 However, if a rotatory chair test is not available, these test may have some value. VAT tests have been used in unilateral syndromes(Perez et al. 2003; Koizulka et al, 1995; O'Leary et al, 1991), but caloric testing is far superior. There are many other ways to corroborate a unilateral loss such as vibration, head-impulse, and head-shaking tests. VAT/VORTEQ tests are useful in patients with bilateral loss, when a rotatory chair test is not available. The figure below shows data from a patient with gentamicin ototoxicity. VAT test for patient with bilateral loss due to gentamicin ototoxicity. Note that the high frequency gain drops compared ot the normal limits. Caloric test from same patient. There is no response. Ice water was also absent. The value of this test is that it confirms bilateral loss -- which is important, as caloric tests can be falsely positive. When both a rotatory chair and VAT test are done, the high-frequency results usually show better gain on the VAT/VORTEQ tests, because patients have both cervical input and vestibular input. In other words, the VAT/VORTEQ tests, like all other "active" head rotation tests such as the "HIT" test, overestimate vestibular function because they have contributions from neck and/or higher cortical function. However, the HIT test is better than the VAT/VORTEQ as it is not predictable (Della Santina et al, 2002). When a caloric test and a VAT/VORTEQ test are done, again, the active tests nearly always show better vestibular function than the caloric test. There are two reasons for this -- Calorics assess the low-frequency end of the vestibular system, which is far more vulnerable to disease than the high-frequency end. Second, caloric tests are much more vulnerable to poor technique and blunders than the VAT/VORTEQ tests. Belafsky et al (2000) reported that patients with BPPV were about 2 times more likely to have normal gain and increased vertical phase than comparison patients with other disorders. As BPPV is easily diagnosed with positional testing, this observation is of no diagnostic value. As of 2013, we could find no papers about results of VAT-VORTEQ and Head Injury in Pubmed. From this, we conclude that at present there is no proven diagnostic utility for this group. Hirvonen et al (1998), who used their own term -- head autoration test -- suggested that "The HART is a complementary method for evaluating the natural frequency range of the VOR, and evaluation of MD patients may benefit from combined results of the caloric test and HART". O'Leary and Davis (1990) reported that vertical gain is "markedly high" at higher frequencies (2-6 hz). Overall, data is present for utility in Meniere's disease. Helm (2005) reported that patients with migraine have higher vertical phase at high frequencies, using VAT. However, the phase measured by these devices at high frequencies is suspect due to head movement sensor slippage. No data is available using the VORTEQ device. Naichem (2002) reported that "VAT measurements could not be used for practical purposes to categorize individual motion sickness susceptibility." Belafsky, P., G. Gianoli, et al. (2000). "Vestibular autorotation testing in patients with benign paroxysmal positional vertigo." Otolaryngol Head Neck Surg 122(2): 163-167. Blatt, P. J., M. C. Schubert, et al. (2008). "The reliability of the Vestibular Autorotation Test (VAT) in patients with dizziness." J Neurol Phys Ther 32(2): 70-79. Corvera, J., G. Corvera-Behar, et al. (2000). "Evaluation of the vestibular autorotation test (VAT) for measuring vestibular oculomotor reflex in clinical research." Arch Med Res 31(4): 384-387. Della Santina, C. C., P. D. Cremer, et al. (2002). "Comparison of head thrust test with head autorotation test reveals that the vestibulo-ocular reflex is enhanced during voluntary head movements." Arch Otolaryngol Head Neck Surg 128(9): 1044-1054. Helm, M. R. (2005). "Vestibulo-ocular reflex abnormalities in patients with migraine." Headache 45(4): 332-336. Hirvonen, T. P., H. Aalto, et al. (1999). "Comparison of two head autorotation tests." J Vestib Res 9(2): 119-125. Koizuka, I., J. Yamakawa, et al. (1995). "Time course of vestibular function in patients with meniere's disease following vestibular nerve section." Acta Otolaryngol Suppl 519: 234-237. Meulenbroeks, A. A., H. Kingma, et al. (1995). "Quantitative evaluation of the Vestibular Autorotation Test (VAT) in normal subjects." Acta Otolaryngol Suppl 520 Pt 2: 327-333. O'Leary, D. P. and L. L. Davis (1990). "Vestibular autorotation testing of Meniere's disease." Otolaryngol Head Neck Surg 103(1): 66-71. O'Leary, D. P., L. L. Davis, et al. (1991). "Vestibular autorotation test asymmetry analysis of acoustic neuromas." Otolaryngol Head Neck Surg 104(1): 103-109. Perez, N., E. Martin, et al. (2003). "Results of vestibular autorotation testing at the end of intratympanic gentamicin treatment for Meniere's disease." Acta Otolaryngol 123(4): 506-514. Tirelli, G., S. Bigarini, et al. (2004). "Test-retest reliability of the VOR as measured via Vorteq in healthy subjects." Acta Otorhinolaryngol Ital 24(2): 58-62.